Lets start at the basics. You probably know that there are two different types of electrical power is use which are Direct current (DC), which is supplied by batteries and solar panels etc. This type of power is mainly used by small digital goods with circuit boards etc. The other type of power is Alternating Current (AC) this is supplied from the power sockets in your homes and this is typically used to power larger appliances. 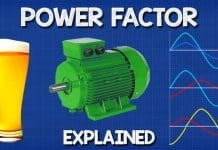 Both types of power have their uses and limitations so we often need to convert between the two to maximise their use. An inverter is a device which is used to convert between Direct Current (DC) and Alternating Current (AC). If you used an oscilloscope to look at the signal of these two types of power you will see that Direct Current sits at its maximum voltage and continues in a straight line. That’s because the current flows directly in only one direction, which is why it’s called direct current. It’s a bit like a river or canal, it’s always at its peak and it flows in one direction. If you used an oscilloscope to look at Alternating Current you’ll see a wave like pattern where the voltage alternates between its two peak voltages in the positive half and the negative half of its cycle. This is because the current travels back and forth. It’s a bit like the tide of the ocean where it reaches its maximum high tide and maximum low tide and the current of the water changes direction between these to peaks. So an inverter simply converters from DC to AC and this is a very useful invention. You can also convert from AC to DC using a rectifier and its common to find both of these in some devices. 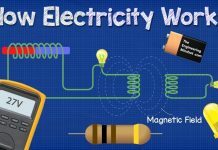 If you want to learn more about electricity, then watch our previous video on How Electricity Works. 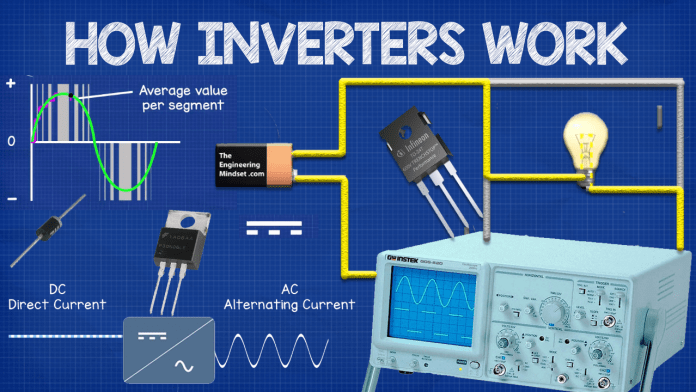 A common and fairly simple application of inverters is within photovoltaic arrays, as these generate DC power, but, the appliances in your home will use AC power so this needs to be converted for it to be of use. You can also buy portable inverters for your car which allow you to use the cars battery to power small household appliances. 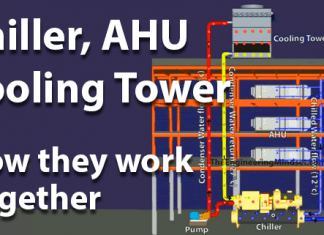 A slightly more complex way they are used is when integrated into Variable Frequency Drives (VFD) otherwise known as Variable Speed Drives (VSD) to control the speed, torque and direction of AC motors to achieve very precise control which also saves energy. You’ll find these on fans, pumps and compressors and basically any equipment which rotates. They are used in all industries and extensively within HVAC systems for industrial and commercial properties. In this application the inverter is coupled with a rectifier and the AC power that comes in is converted to DC, then back to AC, but the controllers will change the frequency of the sine wave pattern. 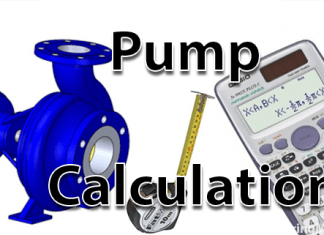 By manipulating this the motors behaviour can be precisely controlled, and thus when connected to a fan, pump or compressor then this can also be precisely controlled. 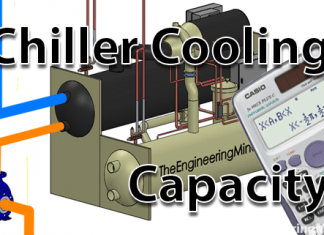 This is partly how the Danfoss Optyma plus inverter condensing unit works, it has a very clever control loop which is measuring the cooling load and then changes the speed of the motor, which changes the speed of the scroll compressor and that increases or decreases the cooling capacity to match the load and achieve precise temperature control as well as energy savings. 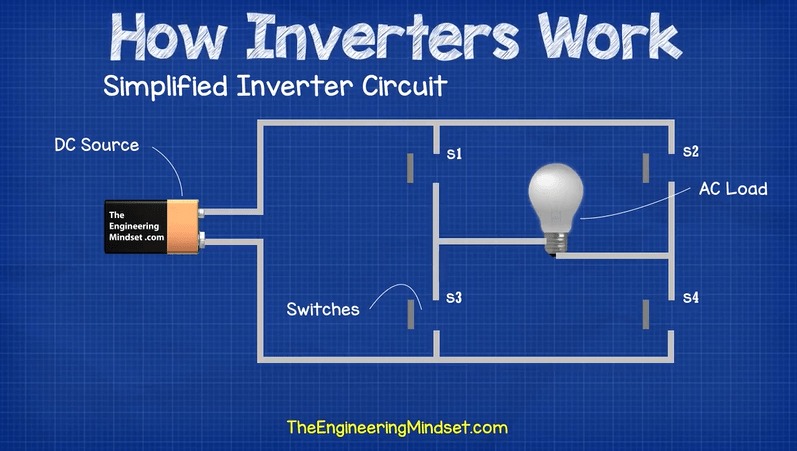 Lets consider a simplified circuit where a DC source is being used to power an AC load. To convert the DC to AC there are 4 switches. The switches are paired together so that switches 2 & 3 open when 1 & 4 close and vice-versa. 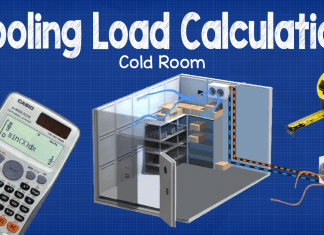 This will force the current through the load in an alternating direction, therefore the load will experience an alternating current even though its from a DC source. If switches 2 & 3 close and switches 1 & 4 open, this will cause the current to flow through the right hand side of the lamp. If switches 1 & 4 close and 2 & 3 open then this will force the current to flow through the left hand side of the lamp. So you can see there is a direct current source but the lamp experiences an alternating current. The lamp will not see this as a sine wave however as the sudden switching will only result in a square wave. The sharp corners of the square wave can be damaging to electrical equipment so these need to be smoothed out. The switching is also far too fast for a human to do, if you consider the electricity you receive in the power sockets of your home, this will be supplied at 50 or 60Hz depending on where in the world you are. This means the current needs to reverse direction 50 or 60 times per second. To achieve the required switching speed, engineers use special electronic components such as diodes, IGBTs, MOSFETs etc. 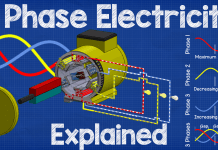 Lets consider a 3 phase power example for a motor. You can see this circuit has a DC source and an AC load and to convert the Direct Current into Alternating Current there are a bunch of IGBT’s which are connected to a controller. This controller will send a signal to each IGBT telling it when to open and close. These IGBT’s are paired together. When the circuit is powered up, you can see the controller is switching pairs of IGBT’s to allow current to pass through them for a set amount of time so that the motor will experience an alternating current, in this example the alternating current is in 3 phases. If we take a closer look at the IGBT’s we’ll see that they actually open and close in a pulsating manner multiple times per cycle. This is known as pulse width modulation. Whats happening is the cycle has been broken up into multiple smaller segments, and the controller tells the IGBT’s how long to close for, during each segment. 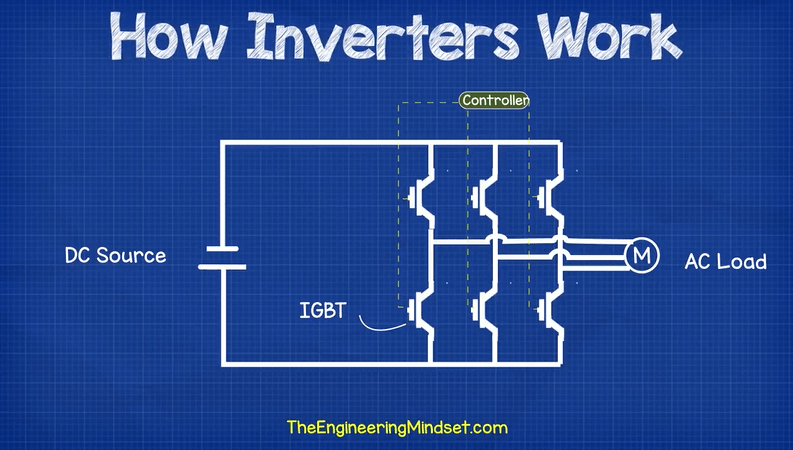 By opening and closing the switches at varing lengths of time during each segment of each cycle, the IGBT’s can allow varying amounts of current to flow through the circuit and into the motor. The result of this is that the average power over each segment will result in a sine wave pattern. The more segments the cycle is broken into, the smoother the sine wave will be and the closer it will mimic a real AC sine wave. The motor will see the average value and will therefore experience a sine wave alternating current. The controller can change the amount of time the IGBT’s are open to increase or decrease the frequency and wave length to control the motors speed, torque and direction and with a few additional control loops it can be used to exactly match the required loading to provide precise control of a system and unlock energy savings. Thanks for this great presentation. It seems like an inverter using IGBTs still can not mimic an exact 100% AC voltages to the load and still there are sharp edges on the sine wave. Will that eventually damage a load(example an inverter used to convert 12 VDC car battery to run an audio amplifier OR a TV used in a park to watch a football game.)? Hello sir this amazing knowledge about Inverter. In this post you are use animated image is too good. Thank you million of times!! I already studied all of this and graduated and now working in electricity company but your articles make it 1000 easier to understand. Please continue providing such articels.